June 01, 2012 in "etsy update", "one of a kind"
Mmmmmm so pretty! Dyeing One of a Kind colourways makes me soooo happy. A) A lot of these colourways are not exactly reproducible. 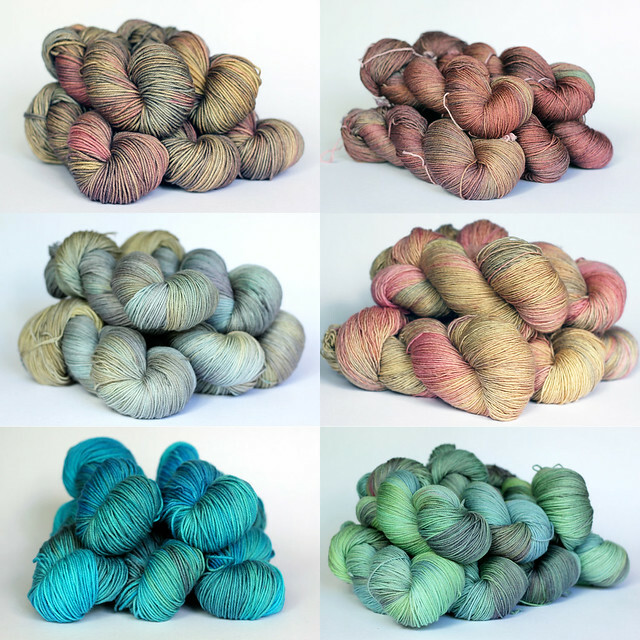 What makes them so awesome is that they are layered in such a way that I just couldn't achieve the same look in my production dyeing. Sometimes I'll try a combination of colours and it just doesn't work, so I mix up some more dye and throw in "a little bit of this and a little bit of that", I pour it on, swirl it around, take the yarn out, look at it in natural light and then put it back into something else until the colours come together to create something beautiful. By the time I'm finished I have no idea what I've done, I just know that the colourway is awesome and truly One of a Kind! For now, I'm very happy to just play around in my dye studio from time to time with complete reckless abandon, not worrying about writing things down or taking careful notes. It's dyeing at it's most fun, most carefree. I love being able to do it, I hate having to part with them, but I appreciate so much that I live in a world where there are other knitter's who love the One of a Kind's as much as I do! Don't forget, tomorrow, Saturday, June 2 at noon for the update!